Not to be confused with Hadera. "Ivy" redirects here. For other uses, see Ivy (disambiguation) and List of plants known as ivy. 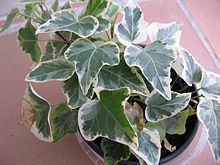 Hedera, commonly called ivy (plural ivies), is a genus of 12–15 species of evergreen climbing or ground-creeping woody plants in the family Araliaceae, native to western, central and southern Europe, Macaronesia, northwestern Africa and across central-southern Asia east to Japan and Taiwan. On level ground they remain creeping, not exceeding 5–20 cm height, but on suitable surfaces for climbing, including trees, natural rock outcrops or man-made structures such as quarry rock faces or built masonry and wooden structures, they can climb to at least 30 m above the ground. Ivies have two leaf types, with palmately lobed juvenile leaves on creeping and climbing stems and unlobed cordate adult leaves on fertile flowering stems exposed to full sun, usually high in the crowns of trees or the tops of rock faces, from 2 m or more above ground. The juvenile and adult shoots also differ, the former being slender, flexible and scrambling or climbing with small aerial roots to affix the shoot to the substrate (rock or tree bark), the latter thicker, self-supporting and without roots. The flowers are greenish-yellow with five small petals; they are produced in umbels in autumn to early winter and are very rich in nectar. The fruit is a greenish-black, dark purple or (rarely) yellow berry 5–10 mm diameter with one to five seeds, ripening in late winter to mid-spring. The seeds are dispersed by birds which eat the berries. The species differ in detail of the leaf shape and size (particularly of the juvenile leaves) and in the structure of the leaf trichomes, and also in the size and, to a lesser extent, the colour of the flowers and fruit. The chromosome number also differs between species. The basic diploid number is 48, while some are tetraploid with 96, and others hexaploid with 144 and octaploid with 192 chromosomes. Ivies are natives of Eurasia and North Africa but have been introduced to North America and Australia. They invade disturbed forest areas in North America. Ivy seeds are spread by birds. Ivies are of major ecological importance for their nectar and fruit production, both produced at times of the year when few other nectar or fruit sources are available. The ivy bee Colletes hederae is completely dependent on ivy flowers, timing its entire life cycle around ivy flowering. The fruit are eaten by a range of birds, including thrushes, blackcaps, and woodpigeons. The leaves are eaten by the larvae of some species of Lepidoptera such as angle shades, lesser broad-bordered yellow underwing, scalloped hazel, small angle shades, small dusty wave (which feeds exclusively on ivy), swallow-tailed moth and willow beauty. A very wide range of invertebrates shelter and overwinter in the dense woody tangle of ivy. Birds and small mammals also nest in ivy. It serves to increase the surface area and complexity of woodland environments. Hedera canariensis juvenile leaves, Gomera, Canary Islands. Hedera algeriensis Hibberd – Algerian ivy. Algeria, Tunisia (Mediterranean coast). Hedera canariensis Willd. – Canaries ivy. Canary Islands. Hedera colchica (K.Koch) K.Koch – Persian ivy. Alborz, Caucasus, Turkey. Hedera iberica (McAllister) Ackerfield & J.Wen – Iberian ivy. SW Iberian coasts. Hedera maderensis – Madeiran ivy. Madeira. Hedera maroccana McAllister – Moroccan ivy. Morocco. Hedera nepalensis K.Koch – Himalayan ivy (syn. H. sinensis (Tobl.) Hand.-Mazz.). Himalaya, SW China. Hedera pastuchovii G.Woronow – Pastuchov's ivy. Caucasus, Alborz. Hedera rhombea (Miq.) Siebold ex Bean – Japanese ivy. Japan, Korea, Taiwan. Hedera azorica Carrière – Azores ivy. Azores. Hedera helix L. – Common ivy (syn. H. caucasigena Pojark., H. taurica (Hibberd) Carrière). Europe, widespread. Hedera hibernica (G.Kirchn.) Bean – Atlantic ivy (syn. H. helix subsp. hibernica (G.Kirchn.) D.C.McClint.). Atlantic western Europe. The species of ivy are largely allopatric and closely related, and many have on occasion been treated as varieties or subspecies of H. helix, the first species described. Several additional species have been described in the southern parts of the former Soviet Union, but are not regarded as distinct by most botanists. The only verified hybrid involving ivies is the intergeneric hybrid × Fatshedera lizei, a cross between Fatsia japonica and Hedera hibernica. This hybrid was produced once in a garden in France in 1910 and never successfully repeated, the hybrid being maintained in cultivation by vegetative propagation. Despite the close relationship between Hedera helix and H. hibernica (until relatively recently considered conspecific), no hybrids between them have yet been found. Hybridisation may however have played a part in the evolution of some species in the genus. When the ivy blooms in September it attracts hoverflies and other nectar feeders. Ivies are very popular in cultivation within their native range and compatible climates elsewhere, for their evergreen foliage, attracting wildlife, and for adaptable design uses in narrow planting spaces and on tall or wide walls for aesthetic addition, or to hide unsightly walls, fences and tree stumps. Numerous cultivars with variegated foliage and/or unusual leaf shapes have been selected for horticultural use. Much discussion has involved whether or not ivy climbing trees will harm them. In Europe, the harm is generally minor although there can be competition for soil nutrients, light, and water, and senescent trees supporting heavy ivy growth can be liable to windthrow damage. Harm and problems are more significant in North America, where ivy is without the natural pests and diseases that control its vigour in its native continents; the photosynthesis or structural strength of a tree can be overwhelmed by aggressive ivy growth leading to death directly or by opportunistic disease and insect attacks. Several ivy species have become a serious invasive species (invasive exotic) in natural native plant habitats, especially riparian and woodland types, and also a horticultural weed in gardens of the western and southern regions of North America with milder winters. Ivies create a dense, vigorously smothering, shade-tolerant evergreen groundcover that can spread through assertive underground rhizomes and above-ground runners quickly over large natural plant community areas and outcompete the native vegetation. The use of ivies as ornamental plants in horticulture in California and other states is now discouraged or banned in certain jurisdictions. Similar problems exist in Australia. For example, in both countries the North African drought-tolerant H. canariensis and H. algeriensis and European H. helix were originally cultivated in garden, park, and highway landscaping, but they have become aggressively invasive in coastal forests and riparian ecosystems, now necessitating costly eradication programs. The berries are moderately toxic. Ivy foliage contains triterpenoid saponins and falcarinol. Falcarinol is capable of inducing contact dermatitis. It has also been shown to kill breast cancer cells. The flowers of ivy are pollinated by Hymenoptera and are particularly attractive to the common wasp. The name ivy derives from Old English ifig, cognate with German Efeu, of unknown original meaning. The scientific name Hedera is the classical Latin name for the plant. Old regional common names in Britain, no longer used, include "Bindwood" and "Lovestone", for the way it clings and grows over stones and bricks. US Pacific Coast regional common names for H. canariensis include "California ivy" and "Algerian ivy"; for H. helix, regional common names include the generic "English ivy". The name ivy has also been used as a common name for a number of other unrelated plants, including Boston ivy (Japanese Creeper Parthenocissus tricuspidata, in the family Vitaceae), Cape-ivy or German-ivy (Delairea odorata in the family Asteraceae), poison-ivy (Toxicodendron radicans in the family Anacardiaceae), and Swedish ivy (Whorled Plectranthus Plectranthus verticillatus, in the family Lamiaceae). Like many other evergreen plants, which impressed European cultures by persisting through the winter, ivy has traditionally been imbued with a spiritual significance. It was brought into homes to drive out evil spirits. In Ancient Greece wreaths of ivy were used to crown victorious athletes. In Ancient Rome it was believed that a wreath of ivy could prevent a person from becoming drunk, and such a wreath was worn by Bacchus, the god of intoxication. Ivy bushes or ivy-wrapped poles have traditionally been used to advertise taverns in the United Kingdom, and many pubs are still called The Ivy. The clinging nature of ivy makes it a symbol of love and friendship, there was once a tradition of priests giving ivy to newlyweds, and as it clings to dead trees and remains green, it was also viewed as a symbol of the eternal life of the soul after the death of the body in medieval Christian symbolism. The traditional British Christmas carol, The Holly and the Ivy, uses ivy as a symbol for the Virgin Mary. Ivy-covered ruins were a staple of the Romantic movement in landscape painting, for example 'Visitor to a Moonlit Churchyard' by Philip James de Loutherbourg (1790), 'Tintern Abbey, West Front' by Joseph Mallord William Turner (1794) and 'Netley Abbey' by Francis Towne (1809). In this context ivy may represent the ephemerality of human endeavours and the sublime power of nature. Ivy features extensively in the 2010 movie Arrietty and the poster for the film. ^ "World Checklist of Selected Plant Families". Retrieved June 11, 2014. ^ a b Ingham, C.S. ; Borman, M.M. (2010). "English Ivy (Hedera spp., Araliaceae) Response to Goat Browsing". Invasive Plant Science and Management. 3 (2): 178–181. doi:10.1614/ipsm-09-021.1. ^ a b c Mitchell, A. F. (1975). "Three Forest Climbers: Ivy, Old Man's Beard and Honeysuckle". Forest Record. 102. ^ McAllister, H. (1982). New work on ivies Int. Dendrol. Soc. Yearbook 1981: 106–109. ^ a b c Huxley, A., ed. (1992). New RHS Dictionary of Gardening 2: 60. Macmillan ISBN 0-333-47494-5. ^ Metcalfe, D. J. (2005). Biological Flora of the British Isles no. 268 Hedera helix L. Journal of Ecology 93: 632–648. ^ "Criteria for Categorizing Invasive Non-native Plants that Threaten Wildlands" (PDF). Cal-IPC. 2003-02-28. Retrieved 2010-04-01. ^ "California Invasive Plant Council Interactive Database". Cal-IPC. Retrieved 2014-05-27. ^ M. Kobæk-Larsen; L. P. Christensen; W. Vach; J. Ritskes-Hoitinga; K. Brandt (2005). "Inhibitory Effects of Feeding with Carrots or (-)-Falcarinol on Development of Azoxymethane-Induced Preneoplastic Lesions in the Rat Colon". Journal of Agricultural and Food Chemistry. 53 (5): 1823–1827. doi:10.1021/jf048519s. PMID 15740080. Hutchison, Peter (14 May 2010). 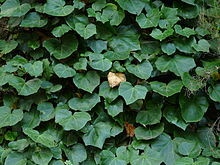 "Ivy is good for walls, finds Oxford University study". The Telegraph. Telegraph. Retrieved 13 March 2014. Wikimedia Commons has media related to Hedera. This page was last edited on 4 March 2019, at 14:20 (UTC).